Blended from all corners of the world, through vast dynasties and sprawling empires, the journey of Indian cuisine is something of a culinary evolution. The Mughals of the Middle East ruled and brought with them dishes of elegance and aroma. The Portuguese colonised the South and introduced an array of unseen ingredients. The British Raj reigned and innovated techniques and traditions. Years of invasion, immigration and interaction continued to transform India’s culture and cuisine. Within its borders, wide-ranging regions, rituals and religions all made its mark on India’s tantalising taste tapestry. Mixed together, this shaped the best known dishes of the modern day world. Spanning three generations, Vijay’s story started small, catering to the ever-present vegetarian community. Serving take-away foods at Vijay’s Sweet Mart, this extended to Vijay’s Chawalla, offering street foods and traditional Indian fare. 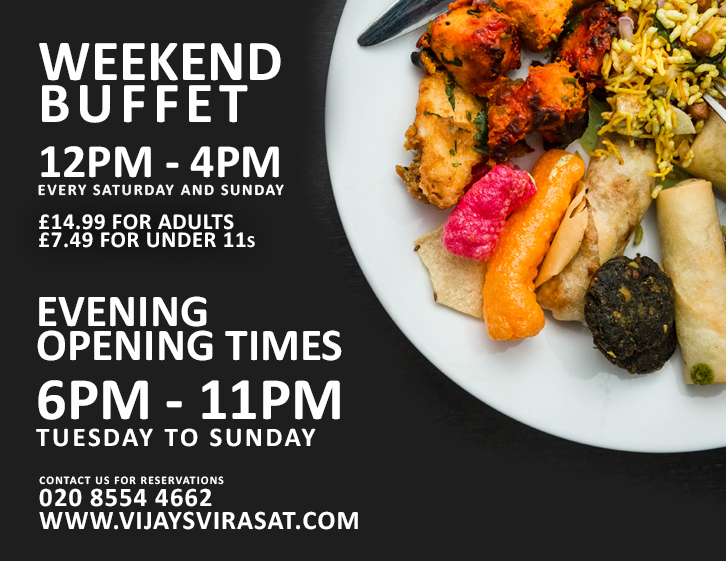 Today we arrive at Vijay’s Virasat, continuing the journey from years of collaboration and adaptation, retaining our respect and passion for creating exquisite vegetarian dishes, whilst welcoming sumptuous non-vegetarian delights to our menu. We want you to reap the rewards of times long gone with a rapturous experience that will stay with you. For reservations, please call 020 8554 4662 to book after 5pm.